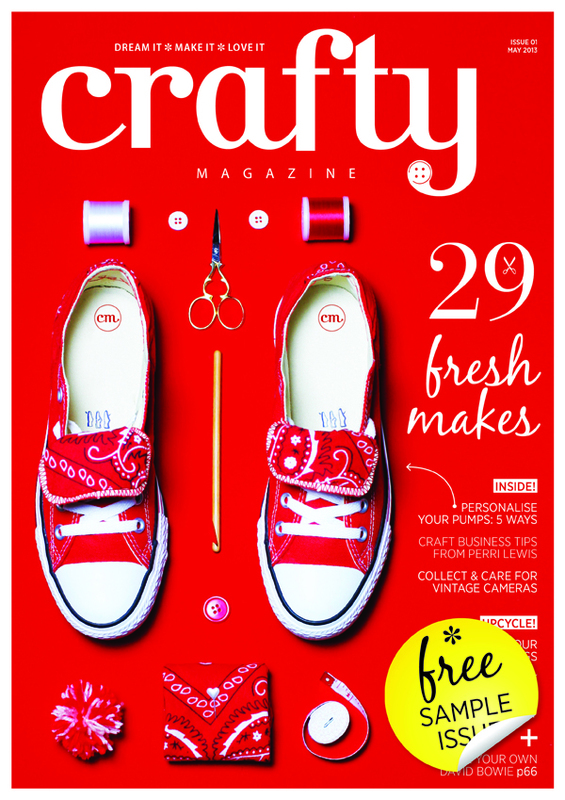 Ooo just look at the cover of the first issue of Crafty Magazine! I can’t wait to hold it in my hands, stroke it & secretly smell it when it comes out 28th March (in Tesco, Sainsburys & WH Smiths but we recommend you buy it in one of the independent retailers near you that sell it or subscribe if you can). Yep as you know, I’m a total magazine (and zine) geeeeeek and when I have a rare day off my favourite thing to do is read a new beautiful & thoughtful creative magazine (with nice paper stock, a strong spine and a beautifully designed layout)- something like Oh Comely, Huck, Colors, Materialist, Stella, … the list could go on. I love searching for new magazines in my favourite magazine shop Wardour News in Soho & heading to zinefests for little treasures & meeting their makers. Craft magazines have definitely come a long way from being super twee patterns of teddies and flower cross stitch designs on the front. The likes of Mollie Makes & The Simply Things have pioneered what craft magazines can look like to cater for the emerging craft scene wanting to push craft to new realms. And it’s always exciting to see more magazines are including crafty projects, features and columns in them too. Fellow Crafty Avengers Mr X Stitch and Perri Lewis are in it too! :) Perri has written a feature for issue 1 and Mr X has signed up to do a monthly column in the magazine showing craft ain’t just for girls or grannies – you just canadian online pharmacy legal know Jamie is going to spotlight some of the most cutting edge craft artists from around the world to keep us in the know. The Editor Sarah Adie is awesome, a craft lover & brilliant visionary! She lives and works on this mag near Manchester, she is part of the exciting Manchester craft scene & is passionate about showing what craft can be and how it can push boundaries and change the world. Plus she has been covering our craftivism projects on her own blog Black Cat Originals for years now. I remember having a phone interview with her 2 years ago! inside the print magazine! Eek! :) Don’t be put of that it’s me (Sarah C) that’s writing it *gulp*. I’m really excited for this opportunity to share my craftivism thoughts, advice, our activities & spotlight other craftivism activities from around the world. It will be hard to edit down what to say each month when I’ll want to say so much! Plus I’m sure it will be great for my whizzing brain to get some of my craftivism thoughts out on paper rather than staying in my little brain buzzing around like crazy bees! Issue 1 is out on 28th March & I urge you to go buy it, tell your friends about it and let us know what you think of the Craftivism column – you know I’m a weirdo that loves to be surrounded by critical friends giving constructive feedback so we can keep improving right?